The schoolhouse was located three miles distance from Kelmscott Manor. It was in 1914, the year Mrs. William Morris died, that schoolmistress, Miss Lily Huntley came to teach. On a daily basis there were a total of thirty children in one room. The schoolhouse only had two rooms, a small one and a larger one. Outside you could find a lavatory and a small playground. The church was located just opposite the schoolhouse. As well as the schoolhouse and the church, there were two other cottages stretching between this three mile pathway leading to Kelmscott Manor where the farm workers and laborers lived. The two families of Robert Hobbs and The Bradshaw’s lived in both cottages. Each cottage contained a large oak front door which opened onto a large living room with three windows and a cement floor. A small kitchen with what was called a ‘copper’ used for washing could be found in the corner with a door leading to the garden out back, a pump outside for water and a curving pathway leading to the lavatory. 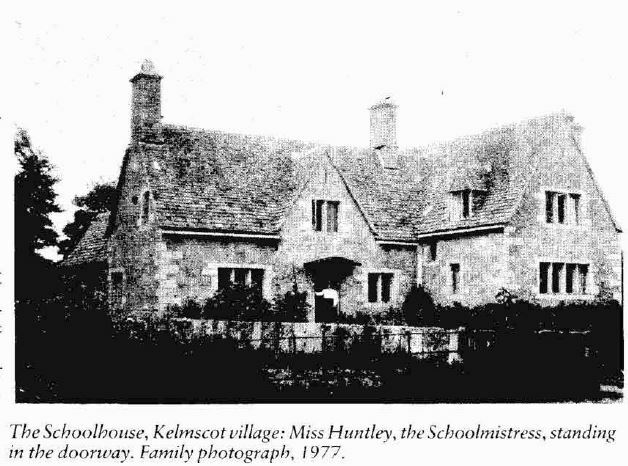 May Morris, daughter of William and Jane Morris, lived at Kelmscott Manor during 1914, her parents deceased and her older sister Jenny in a nurse’s care at a nearby hospital facility. May employed two maids and a gardener and was described by locals as a fun person who preferred to stay very busy gardening and embroidering. Though, when called upon to lecture about her father William Morris, she always travelled to London and rarely cancelled appointments. 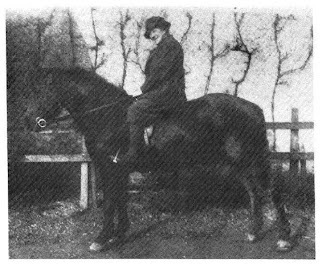 If you lived in one of these cottages and worked at Kelmscott Manor you would not be surprised to find May Morris visiting you on horseback riding her favorite Arab mare, ‘Astola’ named for her white star on her forehead. Astola could be seen poking her head inside the cottage window eating apples and whinnying in approval. 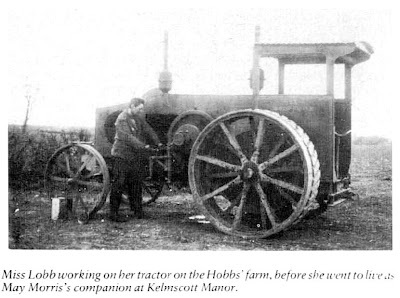 Mary Frances Vivian Lobb worked for Robert Hobbs on his farm three miles away from Kelmscott Manor. She was hired to drive the tractor because she was tall and a very large size with short curly black hair as a man would have worn dressed in men’s style clothing baggy knee-breeches and knee socks with red tie! 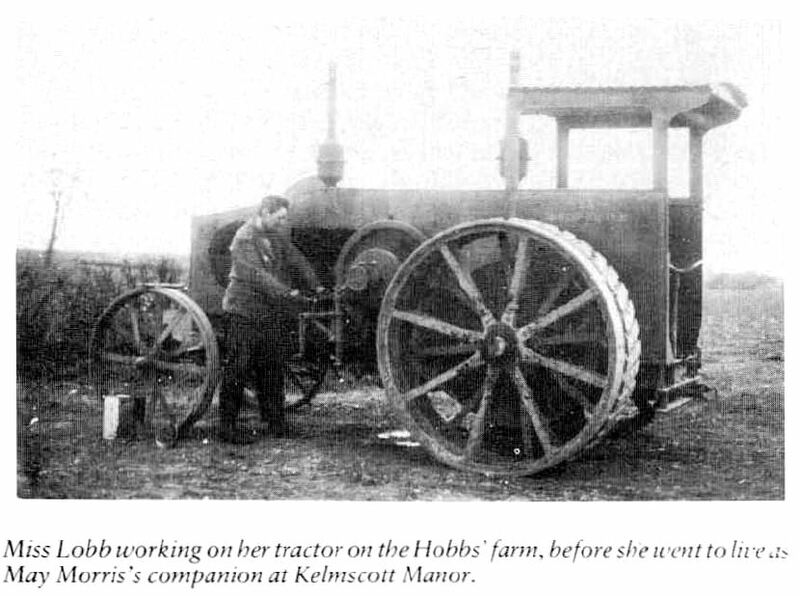 One day, Robert Hobbs found Miss Lobb sleeping next to her tractor and fired her immediately. When May Morris heard about what happened, she was intrigued and hired her on to work at Kelmscott Manor as the lady gardener. Miss Lobb lived at Kelmscott with May Morris becoming her companion until her death in 1939. Most nights friends recall, how Miss Lobb cooked for both of them eating milk pudding and drinking cider. The villagers talked about their sleeping habits. It seems that Miss Lobb slept in May’s bedroom as protection with a shotgun next to the bed because it made May feel safe. They ignored the village gossip. Though, villagers did believe that Miss Lobb was pretending to be interested in the work of William Morris to gain her trust and friendship. Whatever the case may be it worked and they stayed close friends for the rest of their lives. Miss Lobb outlived May Morris by two years passing away in 1939. May Morris must have thought a lot about her friend Miss Lobb because she left her a £12,000 benefit in her will. 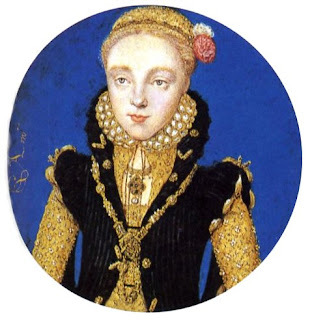 Miss Lobb left Kelmscott and returned to Cornwall. 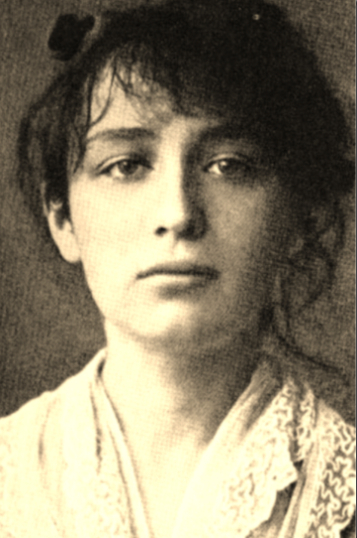 May Morris outlived her entire family and passed away in 1937. The Morris Family is buried in the nearby churchyard. Just a quick blog post sharing these photos and bits of information I've found about these two fascinating women. You're so very welcome, Hermes. Such a seemingly nice time to live, if you had money or a benefactor of course. Lovely old photo's especially of the school that was typical of those days. Hi Kevin, Wasn't it just a great time to live, as you say, if you can afford it. I just love finding old photos and being able to share them! Hi, Kimberly. Kelmscott Manor currently has a new temporary exhibition on that you may be interested in: "Mary Lobb From Cornwall to Kelmscott: A Life Revealed". If you have the chance, I think you'd enjoy the visit. It will be at the Manor for the remainder of the season (until 28 October, Wed and Sat, 11.00 to 17.00). Cheers, Renee (Society of Antiquaries and Kelmscott Manor).